Is this the company that used to have a magazine-sized, cream-colored catalog available through the mail? If so, it is where I got my Abbey Road Black Triangle. Anyone remember? I have had good experiences. There was a glitch when I ordered Led Zeppelin's 3 LP version of CODA that was on sale for $10. I ordered it in November but it sort of disappeared in shipping. I gave them a month for it to show up and then noticed that they had 47 left for sale on Ebay but the price was at $47. I wrote and asked them to ship one of those, which they promptly did. So I still got it for $10. Can't complain. They were very nice about it and most likely the loss of the first package was not there fault. There prices generally are more competitive than Barnes and Noble. I got all my Audio Fidelity SACDs from them for around $19.61 total. The going rate elsewhere was $26 to $30. Maybe find out their terms and conditions before placing an order? How do you know the delay isn't with PayPal's processing, any way? Perhaps if my time were worthless I would spend it reading the fine print of every merchant I shop from. Even then, is it stated somewhere on their site that a cancellation and refund takes more than a week? As it is, I expect reasonable practices. Taking two weeks to issue a refund after making me wait a month for a CD they didn't obtain is not reasonable. You will find a lot of ImportCDs apologists in this thread, so don't expect any sympathy here (but you have mine.) I've made the same mistake you did and, while it did finally work out, it took many weeks, many emails, and many calls. I consider their policies to be unfriendly at best and borderline unethical at worst. E.Baba, lv70smusic, chazz101s and 1 other person like this. Well, after a lot of fighting and waiting ImportCDs refunded the amount paid for the CD - not for shipping however, it looks like they figured they would go ahead and steal that. I wonder how many emails it will take to get them to refund me for that. Whenever possible, avoid ImportCDs. Particularly, never ever place a back order with them. Five business days is pretty standard to process a refund. And I'm sure ImportCDs offered you no guarantee they would be able to fulfill your back order, let alone do it within a given timeframe. You can always pay full price with a seller who has the item in stock if you prefer not to wait. Good luck! 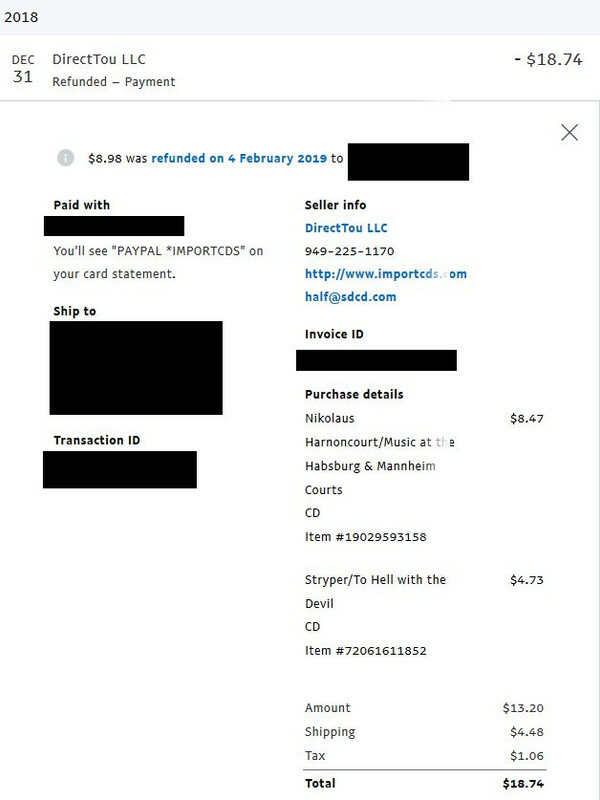 Never pay for a pre-order with ImportCDs using Paypal. There are no problems using a personal credit card, however. They seem to be having more stocking and inventory issues these days. Hot releases often go out of stock fairly quickly and then it's the waiting game to see if/when the item comes back. The issue has nothing to do with "guaranteeing to fill your back order," and you know it. The issue is with them taking payment before they provide the service they promised, and then dragging their asses in refunding the money that is owed, and to add insult to injury, to sneakily try to KEEP some of the money they took that they didn't earn. This is unacceptable. lv70smusic and ClassicalCD like this. I’m pretty sure none of that happened the way this guy says it did. Have him post the email conversation (his so-called “war”) and I’m confident you will see them dealing professionally with an unreasonably difficult customer. Looks as if there were two items in your order, one of which was never fulfilled and you received a refund for. Did you receive the other item, the Styper CD? If so, why expect a full refund of shipping? The only issue I've ever had was with ImportCDs was a few years ago. I ordered the deluxe edition of Duran Duran's Big Thing but I ended up receiving a children's book instead. Not sure how that happened. Every other order went smoothly without any issues. I was finally issued an additional refund for shipping. It took way too much time, insistence, and most worryingly, vigilance, to obtain a full refund, so I wouldn't recommend placing back orders with ImportCDs. eelkiller and GentleSenator like this. I hate there compressed card board mailers cracks the cd cases.